In business since 1992, Saca’s has always been a fast, affordable option in the Village. Many were the evenings that I stopped in for a falafel sandwich and spent under $4. Right across from City Hall and the library, it’s had location going for it too. It’s been the closest thing the Inland Valley has had to a Zankou, at least until Zaky got going. Not everyone liked Saca’s. One Claremont friend refused to go there, and while I liked it okay, I’m not sure I’d have traveled for the privilege. In 2014, the founders retired and sold the small restaurant to a couple of neighbors, who are French. The interior was lightened, the menu updated and the hours expanded. Saca’s is now open for a late breakfast and on Sundays. I’ve been in a couple of times since the handover and, in a possibly heretical comment, found the falafel improved; before the crust was crunchy to the point of seeming burnt, but no longer. Recently I went in for a Sunday lunch with three friends, none of whom had ever eaten there. 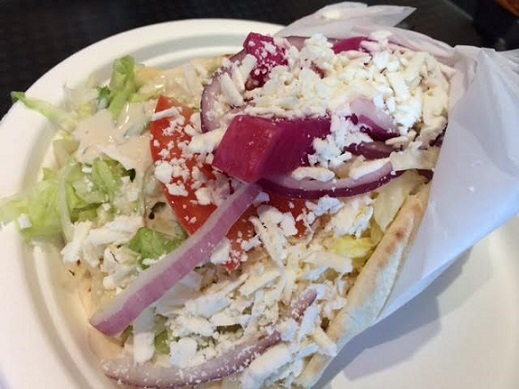 The menu has pita sandwiches, salads, rotisserie chicken and platters, and it’s friendly to vegetarians, vegans and people who want dairy-free and gluten-free items, all marked. 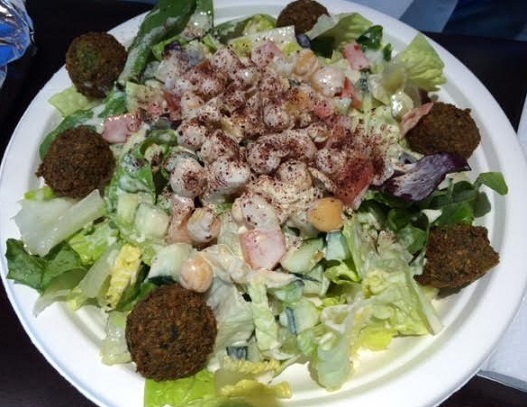 Our table got a falafel salad ($6.29, above), falafel sandwich ($4.89), maza platter ($8.29) and lamb shawerma platter ($10.39). Everybody liked their food. The most poetic said of his salad: “It was fantastic. It was light, delicious and invigorating.” The sandwich man said he was very happy with his order, above, although he admitted there might have been too much of it; not trusting Saca’s, he had spent $2 to add more of almost everything to his sandwich, which he then had to eat with a knife and fork. 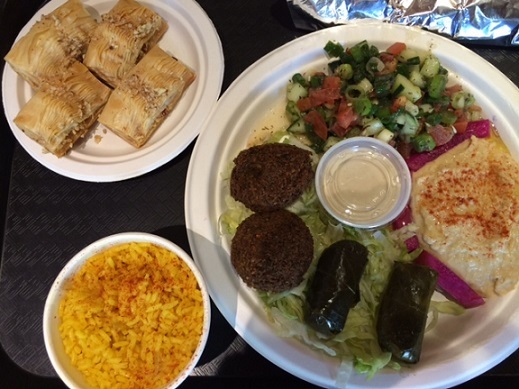 The maza platter, above, had two falafels, hummus, two dolmas (grape leaves), a small salad, pickled turnips and two pitas. The friend who got that liked it, only being disappointed by her $3 side of rice, which didn’t have much taste. My lamb platter was the most expensive thing I’ve ever ordered at Saca’s. 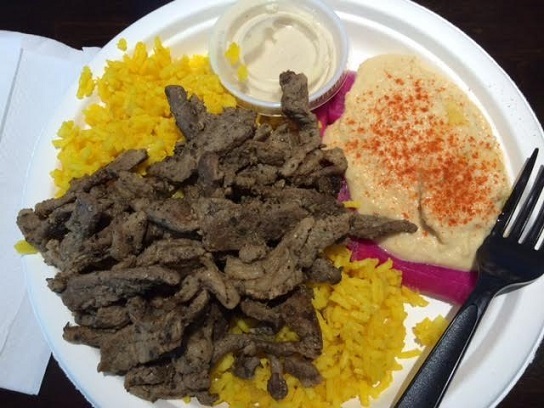 It had small strips of lamb, rice, pickled turnips, hummus and two pitas. Somehow I was expecting more from this plate, but it was good enough. 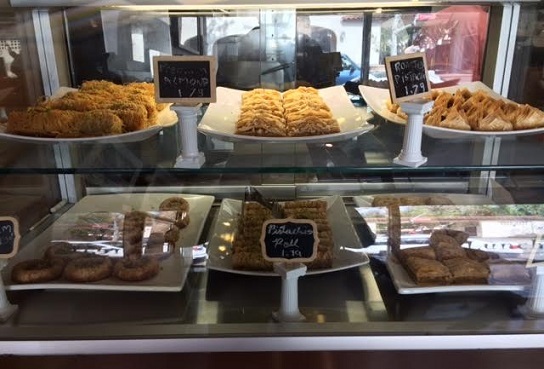 Oh, and we got pieces of baklava ($2) — the bakery case is right by where you place your order — and I got a Moroccan mint tea ($1.59). Invigorating! 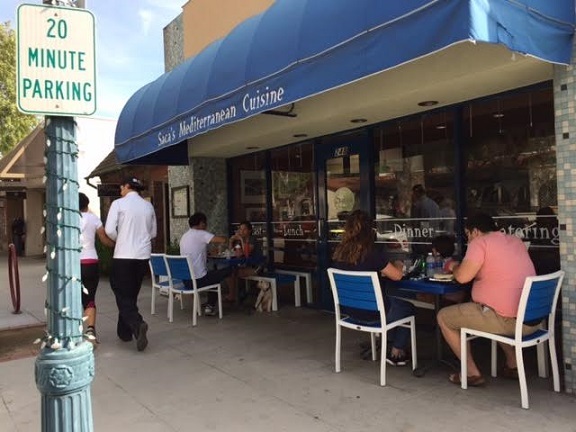 This entry was posted in Restaurants: Claremont and tagged Claremont, Greek, restaurants by David Allen. Bookmark the permalink. Relax, stay a while, explore the Village — or at least go for ice cream. I do like your recommendations. You find comfortable and sensibly priced local places I would miss. Growing up in an Armenian family, we had some pretty good food. So over the years I’ve just come to accept that restaurant food is not going to be the same, and not as good, as what we make at home. It’s not just a matter of quality, but because of the genocide, Armenians were dispersed into so many different places that there are loads of regional differences. Even so, my mom and I ate at Saca’s a few times before she died, and we both enjoyed it. I have to agree that the falafel was overly crispy, but then I’m not a big falafel fan anyway. Their dolma also is pretty good, although my preference is for lamb dolma – very hard to find in a restaurant. I know you occasionally get into Glendale, and I may have recommended this place before. But Elena’s on Glendale Ave is my favorite Armenian restaurant, and was my parent’s fave also. Give it a try, if you haven’t already! BTW, to Armenians it’s Paklava, not Baklava. But either way, it’s still yummy! You probably did recommend Elena’s, and I absolutely did forget it. It took me about five years to go to Billy’s Deli after a newsroom colleague recommended it, but at least I got there a couple of years before it closed for good! I try not to eat beef more than once each week–Saca’s is a real treat when I allow it for myself. I have the beef wrapped in pita bread with sesame sauce, lettuce, tomato, and pickled turnip. I would never think of passing up the walnut square (baklava). I like shawerma sandwiches too, not to mention baklava.